After seeing the hens being chased into the neighbor’s yard, I raced outside as quickly as I could. Everything was a Rhode Island-reddish blur, but I did know that it was a large dog, and the chickens looked (and sounded) terrified. Peeking through the neighbor’s yard, there was absolutely no sign of the chickens or the dog. Our hope was that the chickens had run deep into the neighbor’s bushes or found an escape route that was too large for the dog to follow. Slowly but surely, six of the chickens began reappearing from the front of our house. They must have made a quick turn down the gravel driveway to steer clear of the charging canine. One hen was waiting on the front porch, pecking softly at the door. We gathered the rest of the hens back to their coop/pen for the time being. As the chickens began settling onto their perches, their murmurings seemed to convey their disapproval of the whole ordeal. There was still one hen missing. A light summer drizzle had begun, so we decided to search by car. We made our way down the street, stopping to ask neighbors (who were getting to know us quite well by now) if we could take a look in their backyards. Again, our neighbors were incredibly gracious as we called and searched for the lost hen. We had come quite a long way down the road, when a neighbor noticed us and called out if we were looking for a chicken. Yes indeed, we were! Apparently, he and his wife had seen the chase from their back deck, and he had chased the dog away! Our hero! He was very impressed with the speed of our hen and shared that he and his wife were cheering her on as she ran. She was still heading west when they last saw her. Still heading west? Goodness! How far did she run? By then we were coming to a four-way intersection, and she could have gone in any number of directions. We said a prayer that we would find her soon. If we were already exhausted after herding rabbits, I really don’t know how to describe how tired we were at this point. I was now at the point of putting my head down to cry, but I was too tired to cry. So I simply put my head down. A moment of silence — then a great moment of hope as Jonathan calmly stated, “There she is.” I looked up and there was Apple Bloom or Cinnamon or Henrietta! (as mentioned in a previous post, we had lost track of whose name belonged to whom) But there she was, our sweet hen, slowly crossing the road and looking more exhausted than we were! Why did the chicken cross the road? To get back home, of course! She looked ever so thankful and relieved to be back in her coop! – We really need a fence. – We have such wonderful neighbors! 1.characteristic of a good neighbor, especially helpful, friendly, or kind. This describes our neighbors perfectly — we are so blessed! It’s been quite eventful here the last few weeks. We’ve been enjoying our summer with trips to the mountains, laying out on the new hammock and trying out some great new recipes! 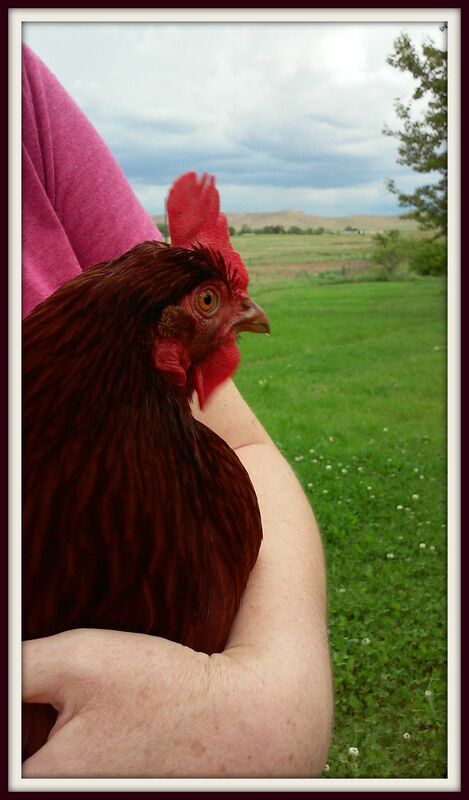 Additional events have included rescuing one of our chickens and numerous bunny chases throughout the neighborhood. Yes, very eventful indeed! A few weeks ago, Jonathan took a few days off to celebrate my birthday. We had planned on taking a family drive up to the mountains, relaxing at the hot springs and enjoying ice cream while walking along the lake. I was up first, sitting on the couch and looking out to a tranquil morning view. Life in the country is so very relaxing — a slower pace, wide-open spaces and …. Wait one minute. Is that one of our bunnies bouncing through the backyard? Yes, life in the country can indeed be relaxing, but not today. The morning blurred as a series of animal adventures began to unfold. All. at. once. By now, Jonathan and the girls were up, and I somewhat frantically shared the news while trying not to startle the girls. We walked briskly around to the front of the house and there was Cashmere sitting calmly under a tree while Sweetie Belle was hopping across the street to meet up with Emma at the neighbor’s house. As Sweetie Belle and Emma went hopping further down the street at a steady pace, we stood there in shock, still wondering where the other two were. What do we do now? Chase the two bunnies gallivanting down the street? Try to guide Cashmere into the backyard? 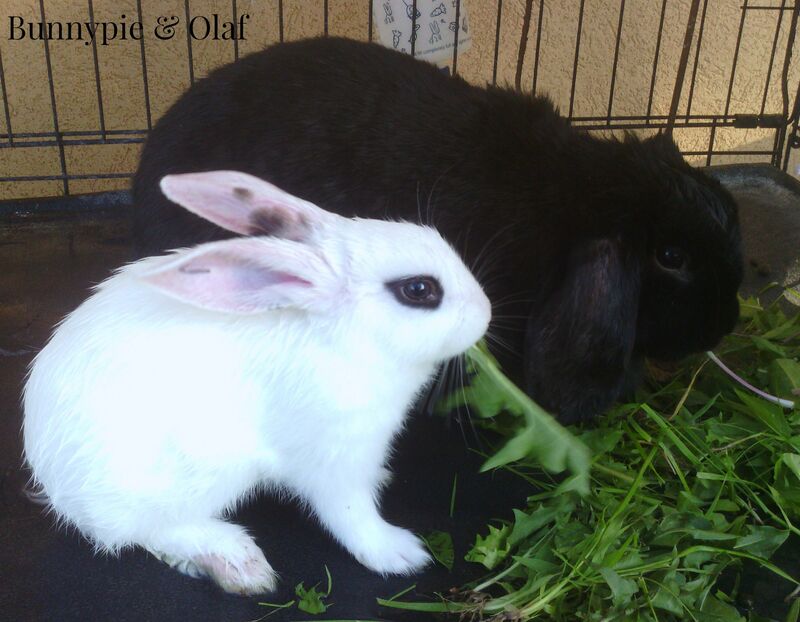 Now we’ve had Bunnypie and Olaf out before, but they are tame enough to stay near us. Bunnypie typically stretches out by her favorite tree while Olaf scampers off to find the chickens. We would often bring one or two of the younger bunnies out at a time, watching as they ran through the grass and munched on clover. They had always stayed relatively close, but not today. They had free range, and they loved it. Needless to say, we spent most of the day on a wild bunny chase. Sounds of barking dogs echoed throughout the neighborhood as I pictured one, two or all five of the rabbits running through various gardens and putting every dog within the block on high alert. I want to tell you how blessed we have been with our neighbors – they are loving, giving and caring people who will go out of their way to help. We could have had a lot of disgruntled neighbors with five of our rabbits running loose in their yards, and they would have every reason to be. Instead, we were deeply touched as sympathetic neighbors came to our rescue to lend a helping hand. After a long day, we somehow managed to catch all of the adventurous rabbits and bring them home. The bunnies looked somewhat disappointed – similar to children being called inside when it’s a lovely summer evening. With the exception of barking dogs, I have no doubt that the rabbits enjoyed their freedom immensely. After Jonathan re-inspected the rabbit pen for additional escape routes, we assumed things had settled down and went inside for some much needed rest. We were exhausted. Chasing rabbits, let alone catching them, is no small feat. They are fast, they are clever and they have much more energy than I ever imagined! Not long after returning inside, I heard a loud and long distress signal from one of the hens, and immediately knew that one or more of them were in need of help. Running to the window, I saw our chickens being scattered everywhere as a large dog chased them into the neighbor’s yard. Oh nooooo! As I’m sure you’ll understand, this post does not include many pictures – I would need an illustrator as it’s very difficult to photograph running rabbits! 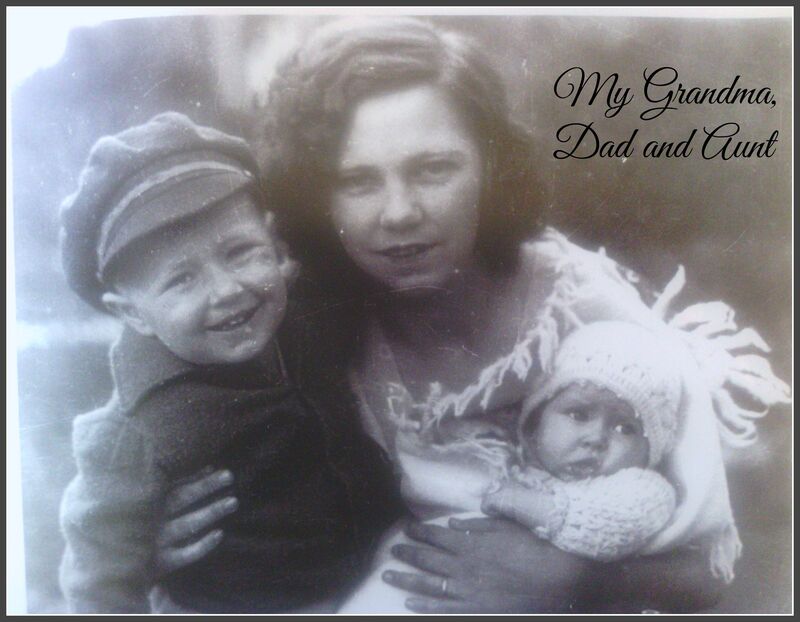 Today’s post is dedicated in loving memory of my wonderful grandma, Charla. Born in Denmark, my Grandma immigrated to the United States with her family at the tender age of two. A wonderful wife, mother and grandmother, one of her greatest joys was cooking for family and friends. Family gatherings were often centered in my grandparent’s warm and inviting kitchen that overlooked their fragrant orange tree and a beautiful garden of daisies, one of my Grandma’s favorite flowers. 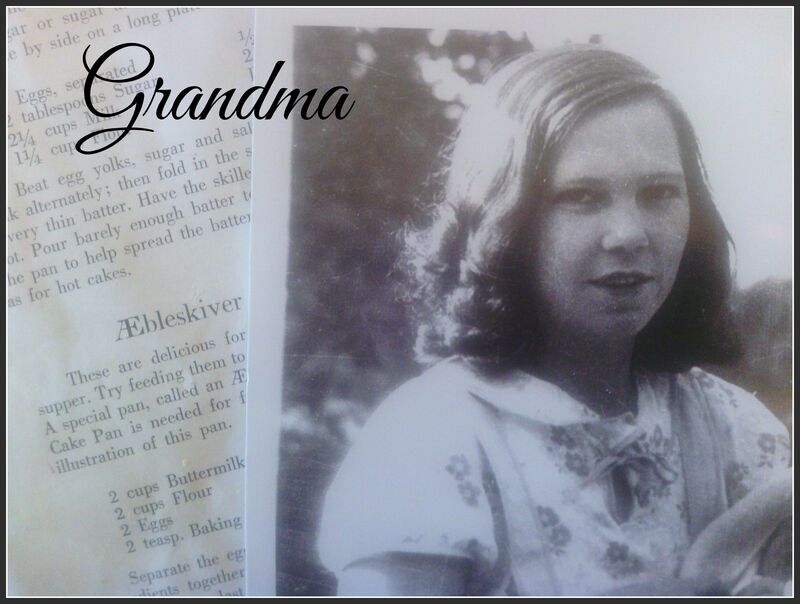 My Grandma was well-known for her many delicious dishes that included a variety of traditional Danish cuisine. 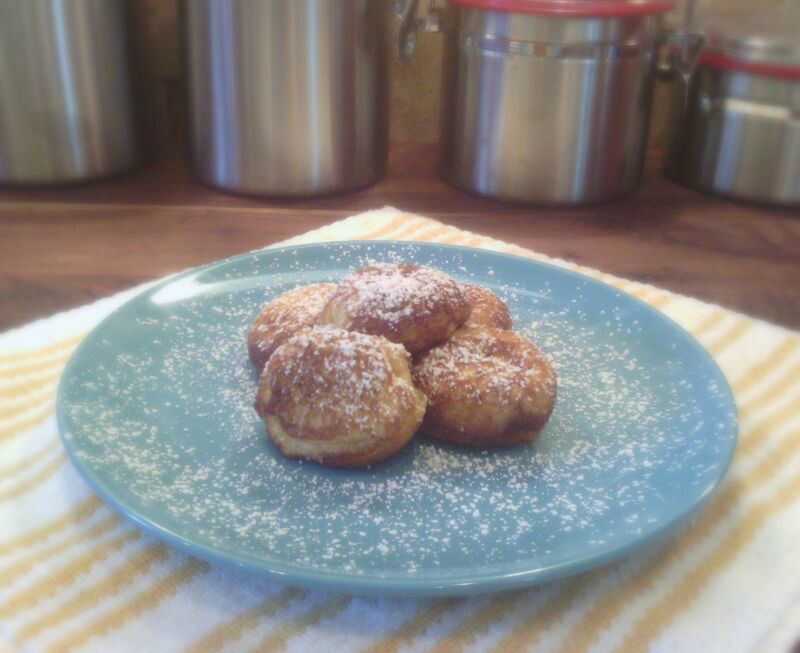 Aebleskiver, or Danish pancake balls, were always a family favorite. This recipe comes from the cookbook, For Danish Appetites by Lyla G. Solum. For this recipe, you will need to use an aebleskiver pan which is available at a variety of cooking stores or online. 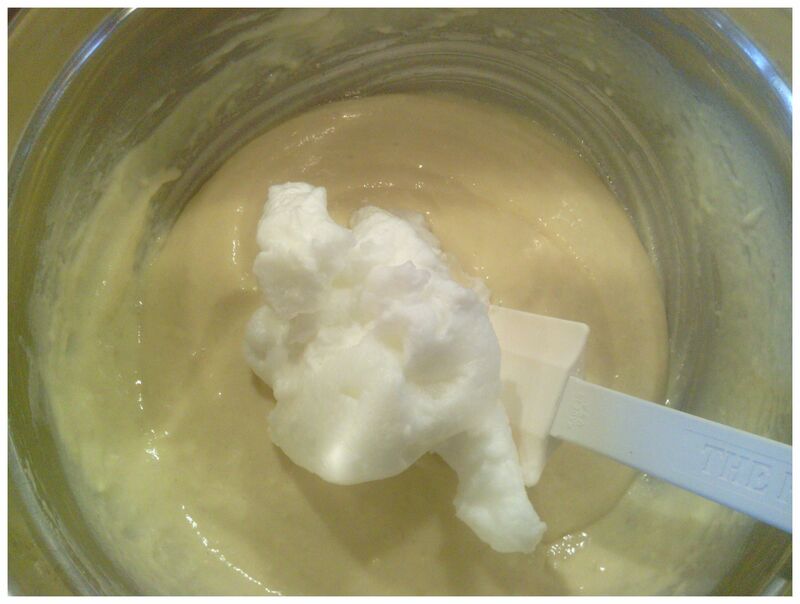 -Separate the eggs and with a stand mixer, hand mixer or wire whisk, beat the egg whites until stiff. -With a wire whisk, combine all other ingredients until batter is smooth. 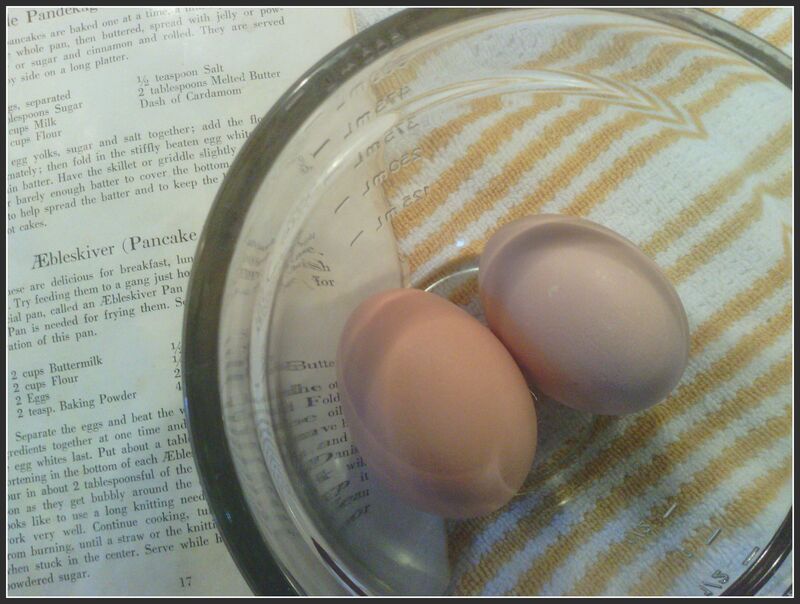 Gently fold in egg whites. 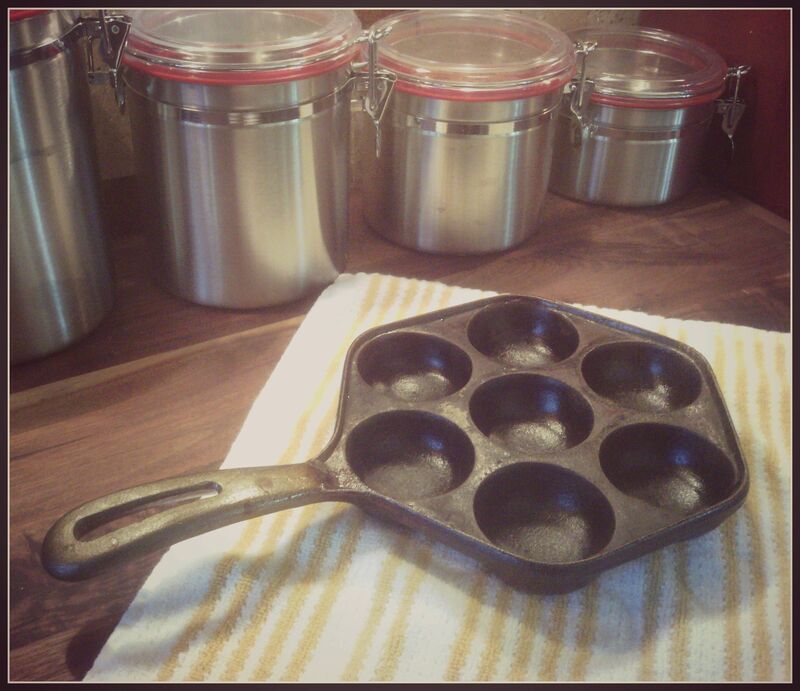 -Over medium heat, put about one tablespoon of oil (I use coconut oil) in the bottom of each aebleskiver pan cup. When the oil becomes hot, put enough batter in each cup so that it barely comes to the top. Too much batter will make the aebleskiver difficult to turn. 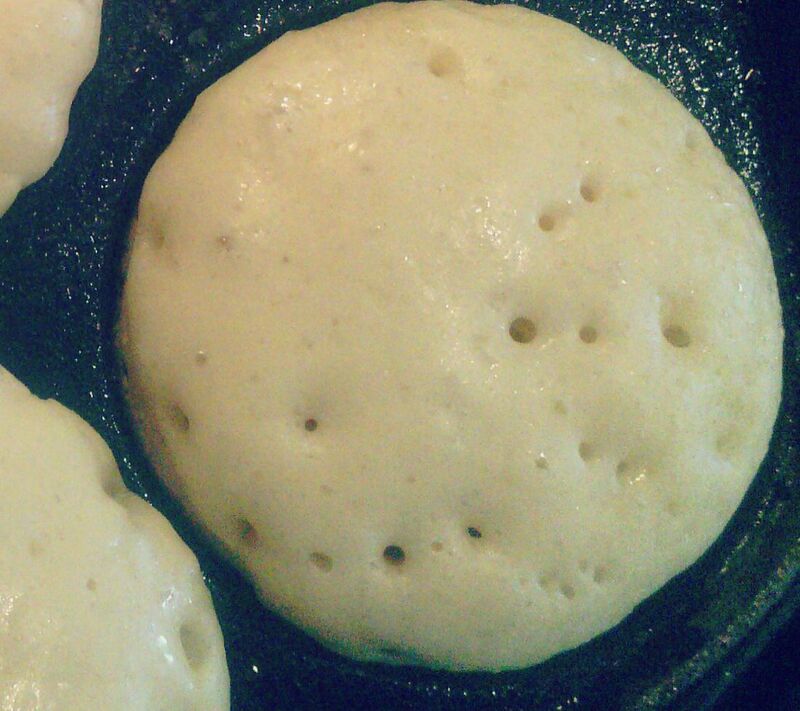 -When you notice bubbles around the edge and towards the middle, it’s time to start turning the aebleskiver. Danish cooks would typically use a knitting needle to turn them, but a fork works well, too! -Continue to let the aebleskiver cook, turning often to prevent burning. When a toothpick comes out clean from the center, remove it immediately. -Aebleskiver are traditionally served warm with jam or maple syrup and sprinkled with powdered sugar. 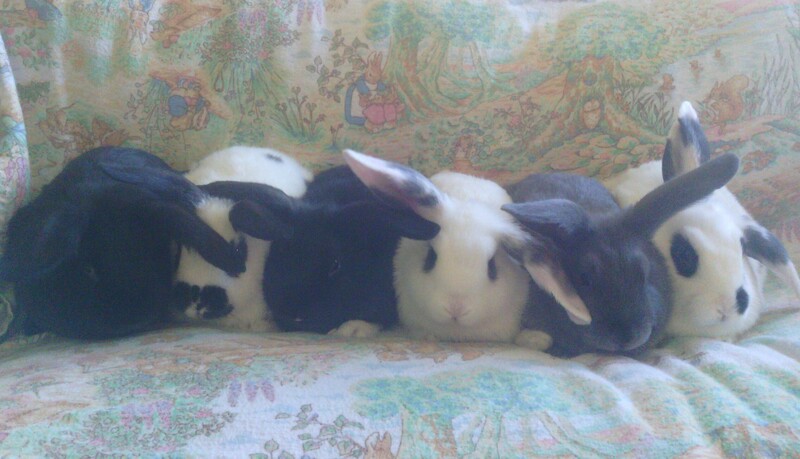 In addition to seven chickens, we have been blessed with a sweet family of bunnies. 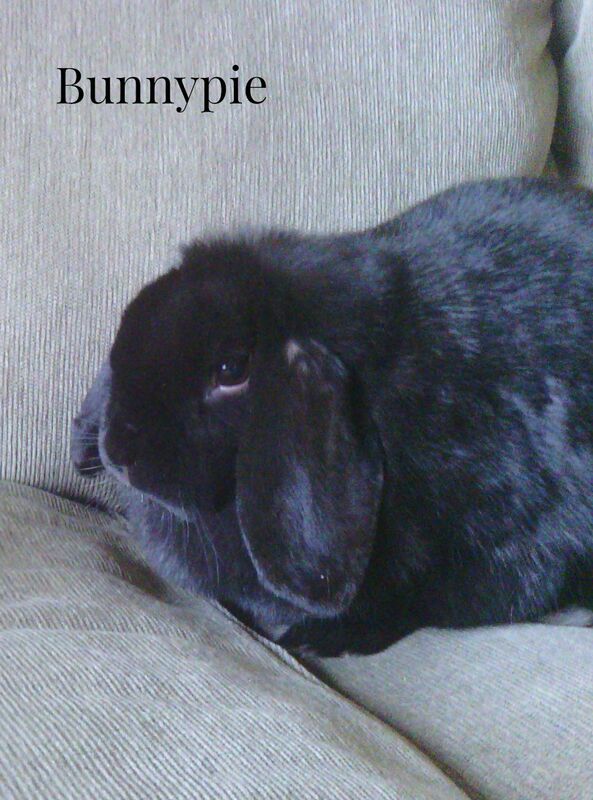 We started off adopting an adorable lop-eared rabbit a little over four years ago that the girls immediately named Bunnypie. Now, coming from the city, I had no rabbit knowledge whatsoever. My husband had a few pet rabbits as a kid, but after they found a way to escape their bunny hutch, he only saw them dashing through the yard occasionally. Bunnypie is a beautiful rabbit, but with her black fur and dark brown eyes, photographing her can be somewhat of a challenge. Her pictures often turn out as a silhouette, especially if someone is holding her while wearing black. We were told Bunnypie was a boy. At least the previous owners referred to her as a “he”, so we figured they knew. Um, no. For almost three years, poor Bunnypie was called “good boy” or “bunny boy” on a daily basis. She was an amiable bunny, but as I watched her in her cage, I couldn’t help but feel she was lonely. The girls and I held her, talked to her and brought her inside when we could, but I felt as though she needed the companionship of another rabbit. One week after bringing the chicks home, we were shopping at a local farm supply store that happened to have several white and black bunnies for sale. The girls and I kept walking back to peak in at them — they were so tiny and cute! Fast forward an hour, and we were on our way home with the newest member of our family, Olaf. Before we left, we were assured by one of the animal experts that Olaf was indeed a male. (at this time, we still didn’t know that Bunnypie was a female) We figured we had another male bunny to be a friend to Bunnypie — perfect! A. baby. bunny. A baby bunny? My head was swirling, and as I followed them outside, I kept pondering the question — where would they find a baby bunny? They stopped immediately in front of Bunnypie and Olaf’s large cage, and there it was. A teeny tiny white baby bunny. I could not comprehend what was happening. We ended up finding two more. They were all so cold! 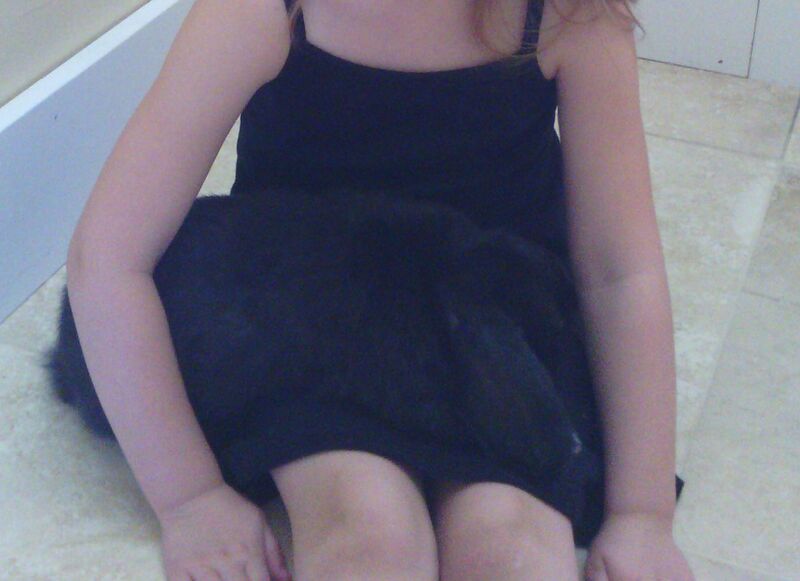 With the help of one of our friends, we brought Bunnypie and the babies into the warmth of our guest bathroom. It was still sinking in that Bunnypie had given birth and was indeed a female! The two days that followed were a hard reality of life on a farm, albeit a very small one. We had immediately consulted some friends that raised rabbits, and they did all they could to educate us, encourage us and help out in any way that the could. They brought Bunnypie a nesting box, checked on her and brought extra timothy grass. 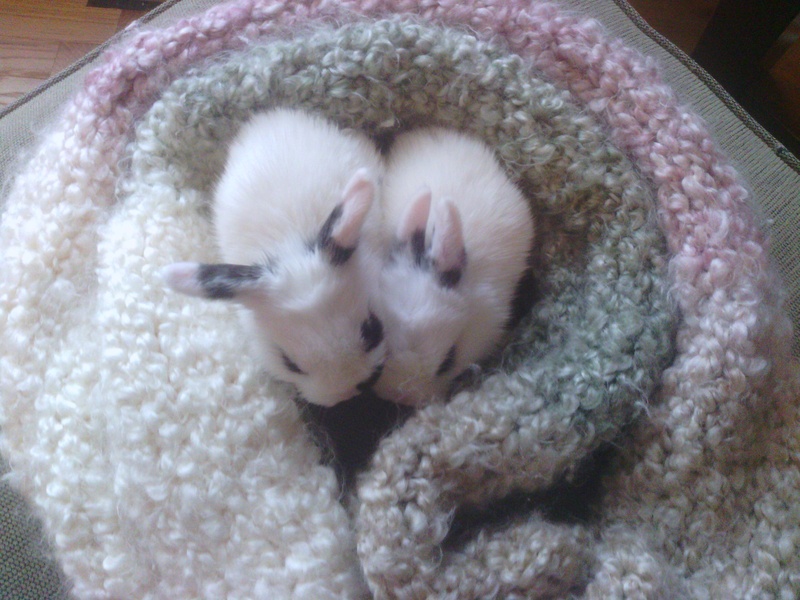 However, the baby bunnies were not thriving, and from the look of their tiny bellies, weren’t getting much milk, if any. We tried warming them with warm blankets and bottle feeding them, but sad to say, they were too weak and passed on.The girls were devastated, as was I. They had come, and left, so suddenly. Time went by, and the girls asked if Bunnypie could ever have babies again. Our friends had noted that Bunnypie would need some time to recuperate, but she could indeed have babies again. 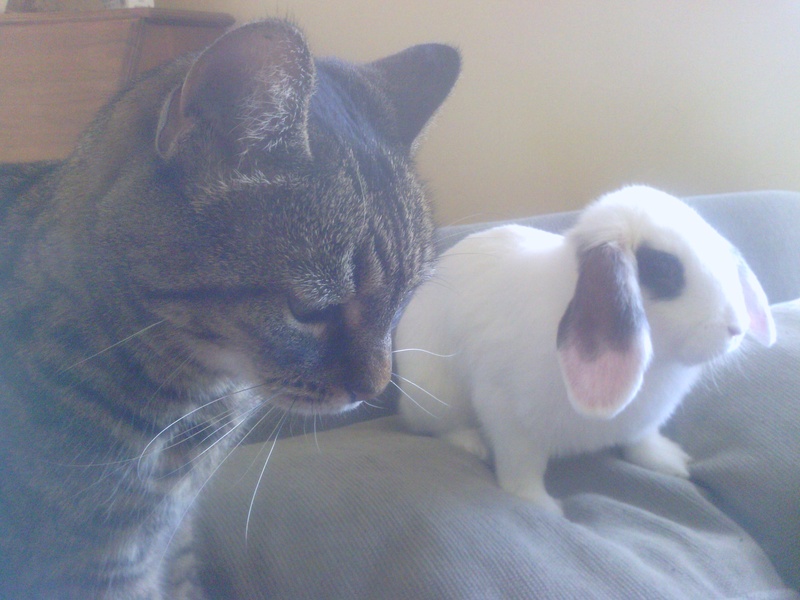 This time we were prepared and kept a close eye on Bunnypie when we knew she would be close to delivering her kits. A few days before the wondrous day arrived, we brought her inside so she could prepare her nest and get settled. 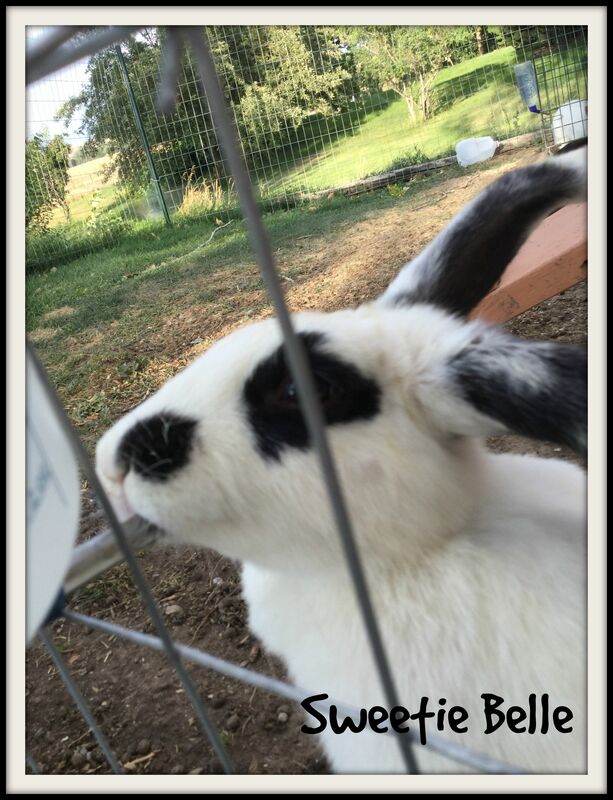 Last January, Olaf and Bunnypie welcomed six darling baby bunnies (Ezra, Esther, Emma, Cashmere, Sweetie Belle and Sabine), and what a lovely addition they have been to our life bellissima! Earlier this week, our monthly Azure Standard order arrived, and I have been so excited to share two of my favorite products with you! In case you have ever wondered what five pounds of organic cocoa looks like, here it is! For someone who enjoys chocolate as much as I do, this is a beautiful sight. My girls still giggle at me when they see how excited I become over five pounds of organic cocoa powder. 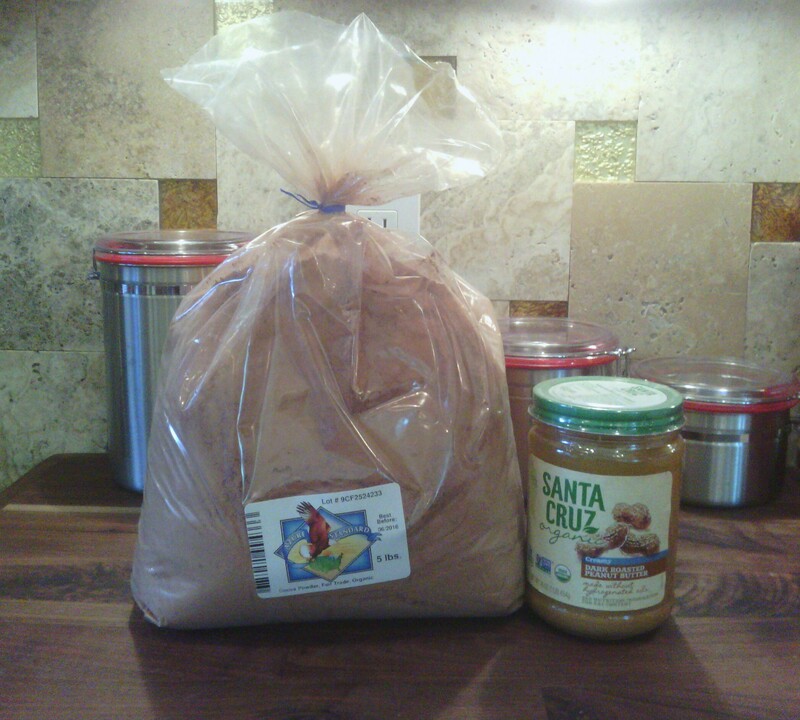 Another family favorite is Santa Cruz Organic Dark Roasted Creamy Peanut Butter (a long title for peanut butter!) — this ingredient makes a fabulous addition to cookies, muffins and smoothies! 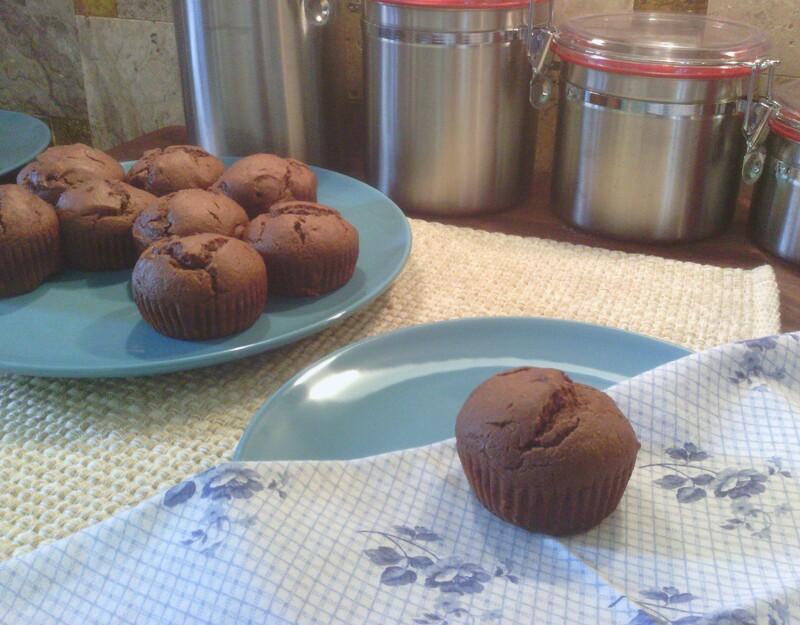 I’ve been wanting to share one of my recipes that incorporates both of these wonderful ingredients — Double Chocolate Peanut Butter Muffins. I am always looking for a healthier breakfast or snack alternative for my family — I’ve found this to be especially challenging when we would go on a road trip or afternoon drive. Inevitably, we would end up at a convenience store with a various assortment of not-so-healthy food items, and within the hour, we were feeling not-so-great. And so began the quest for healthier alternatives that could easily be brought in the car. Yes, I know — this recipe has double chocolate involved, but I am still certain it is healthier than most items you will find in a convenience store. I hope you will enjoy — these have been baked for you with love! – In a stand mixer, hand blender or by wooden spoon, gently combine eggs, chocolate almond milk, honey, peanut butter and coconut oil. 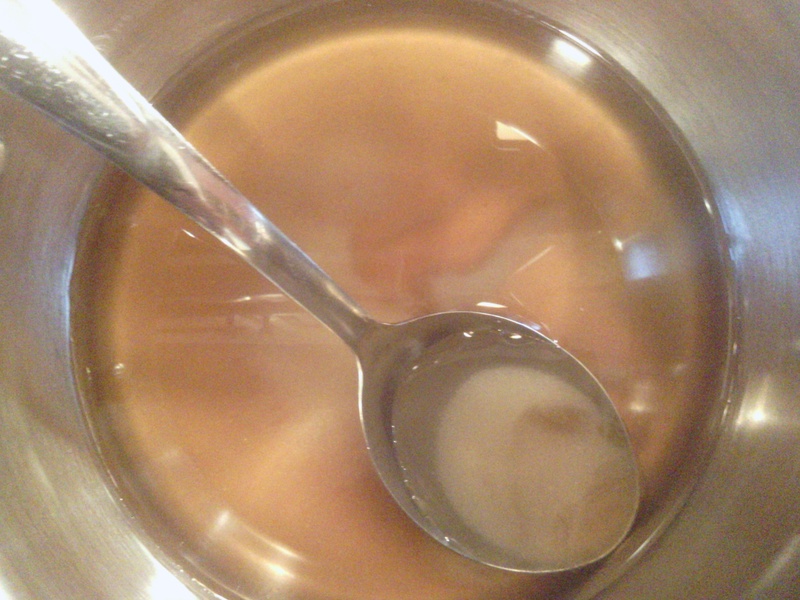 This mixture will need to be mixed very slowly or half of it will come splashing out of the bowl. It won’t look very pretty at this point, either, but it will get there! – Sift together the flour, cocoa powder, salt and baking powder. 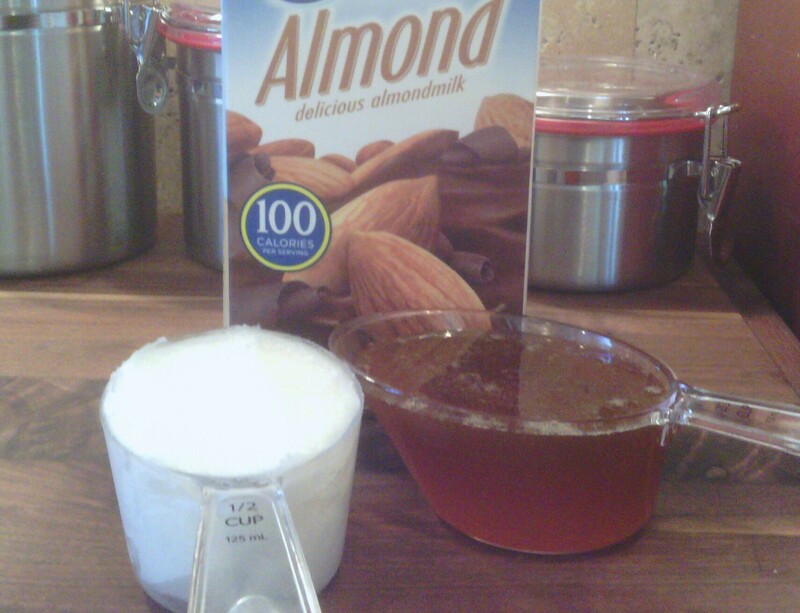 – Slowly add in the dry ingredients until well blended, taking care not to over blend. It should look like cake batter and be much prettier by now! 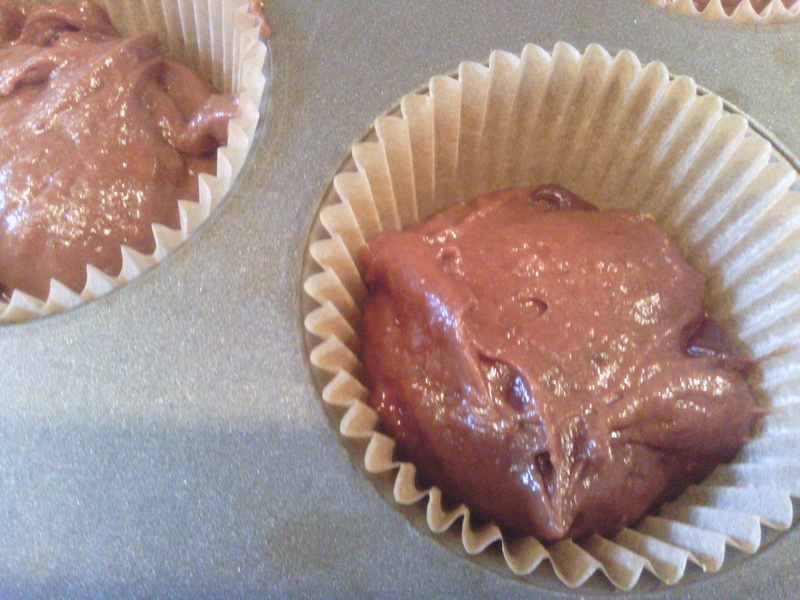 – Add chocolate chips, and give it another slow stir. 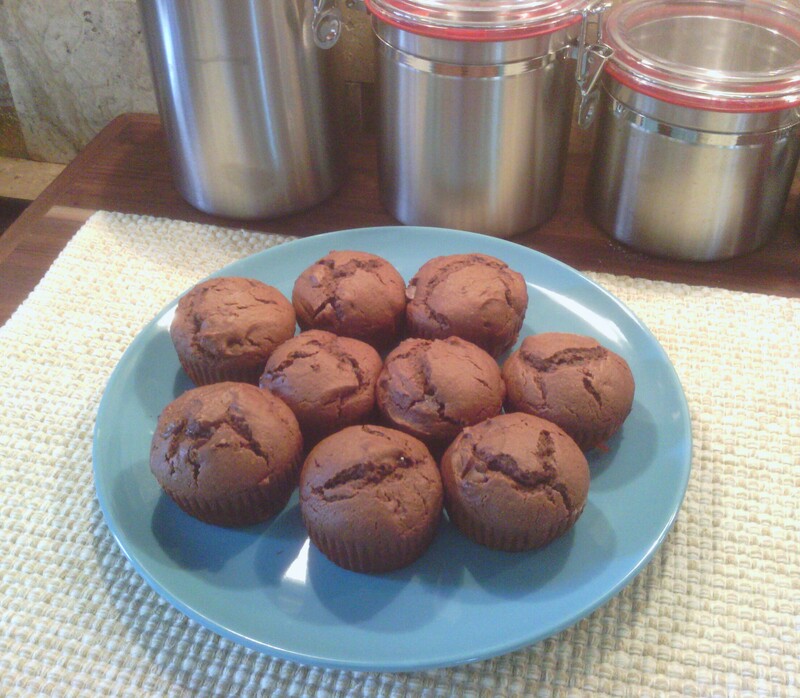 – Line a muffin pan with baking cups and fill each one about 2/3 full. Because of the honey and peanut butter, the batter is pretty sticky. I’ve found that using a cookie scooper works great! – Bake at 375 degrees for approximately 15 minutes or until toothpick comes out clean when inserted in the middle. – Makes approximately 20 muffins. Try at least one while they are still warm! I hope you will enjoy! A few weeks ago, our once little chicks reached the milestone of their first birthday. 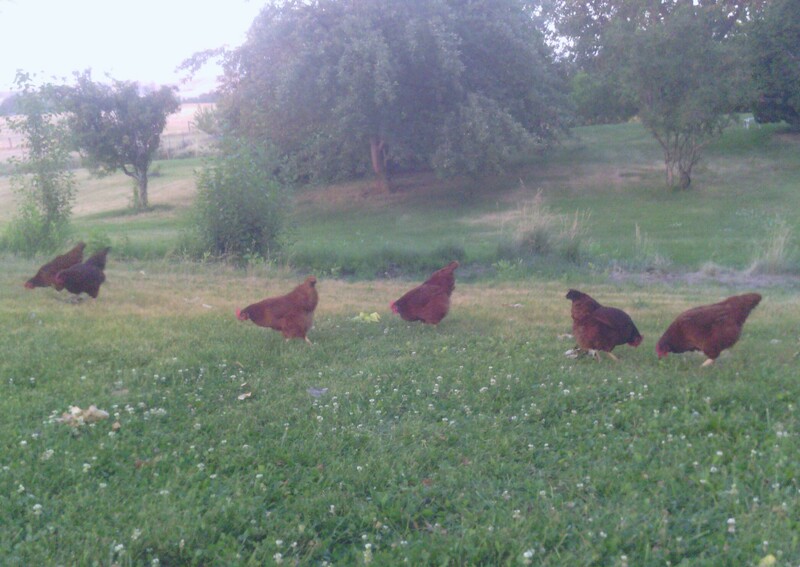 They’ve had an eventful year, and now they are beautiful, full-grown Rhode Island Red hens. I’ve found that you can learn a lot from a chicken — especially seven of them! 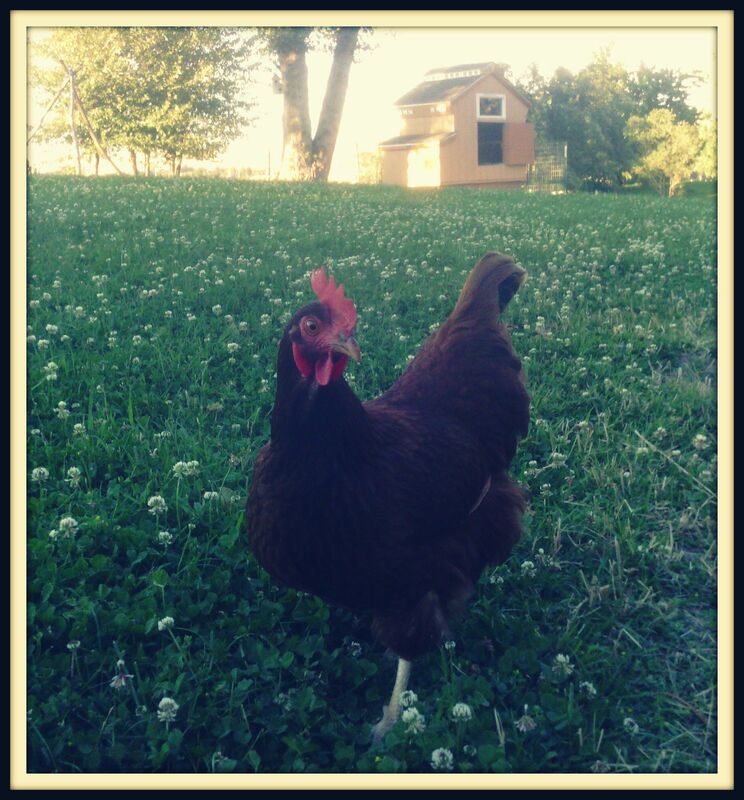 They love having free-range of the yard and have settled nicely into their coop, making it their own home-sweet-home. In addition, Jonathan has attached a pen to the back of the coop for days that we will be gone and want to ensure they are safe and not wandering too far. At around five months of age, we began waiting with great anticipation for the first egg(s) to arrive. 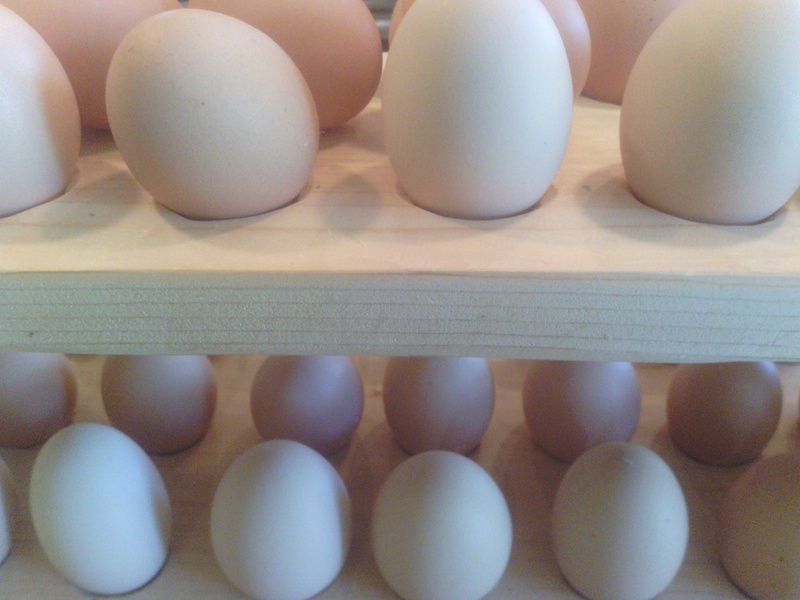 We didn’t have to wait long — Rhode Island Reds are known to be exceptional layers, and our hens did not disappoint! 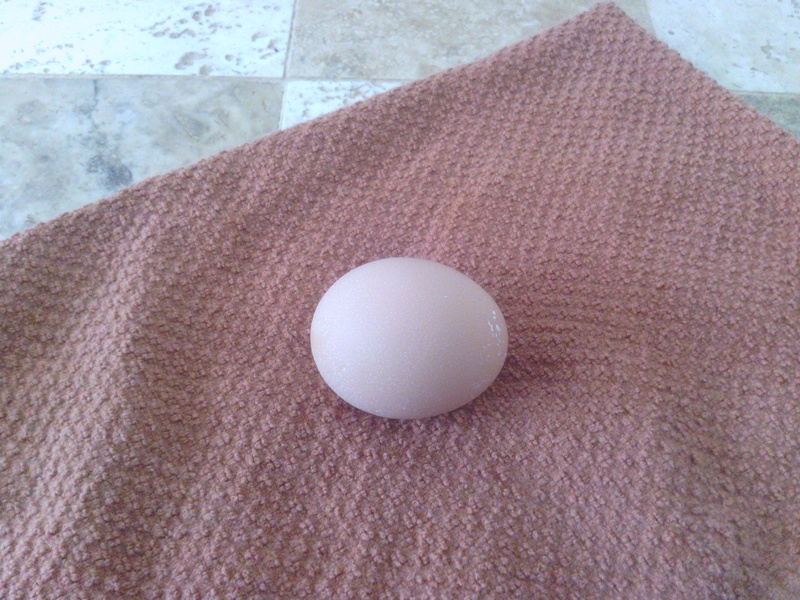 We found the first egg only a few days after they turned five months, and soon after, we were getting seven every day. Spinach-cheese omelets, french toast and chile rellenos are only a few of the dishes we love to prepare with the hens’ organic eggs! In addition to cooking, I love to bake. It’s definitely in my genes. Cakes, cookies, pies – you name it! 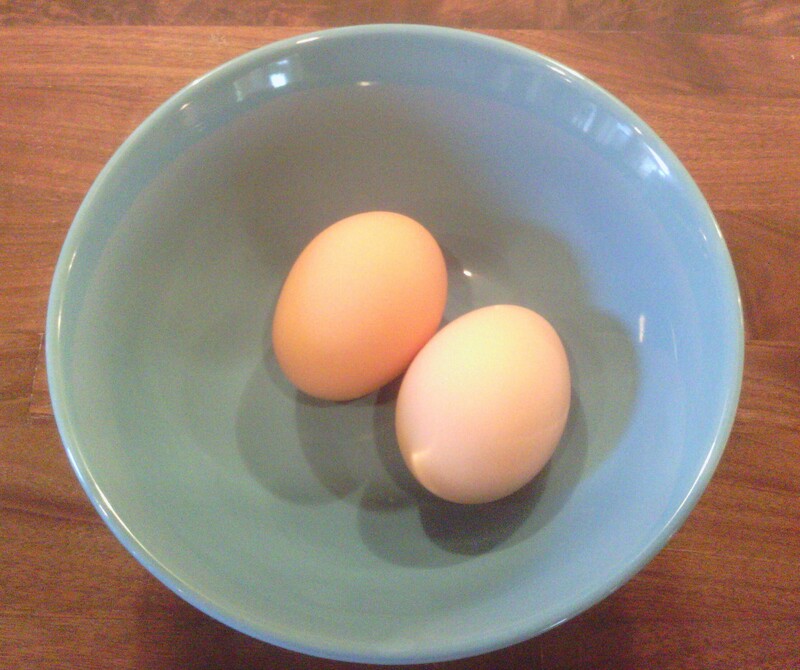 I have learned that even with all of our cooking and baking, we can accumulate a surplus of eggs very easily. The hens do a fabulous job, and it’s a joy to be able to share their bounty with family, friends and neighbors. I have also learned that even with the prerequisite amount of nesting boxes, our hens prefer one nesting box in particular. Each morning, I hear the distressed calls of a hen who desperately wants to lay her egg, thank you very much! But instead of using one of the available nesting boxes, the hens will wait for “the” nesting box. I’m not sure why they favor one in particular. It was very amusing to find three of the hens trying to lay their eggs together. Occasionally they seem to realize that maybe it’s alright to use the other boxes available, but only on occasion. I never would have dreamed that chickens could be so expressive! If any one of us goes outside, one or more of the hens will come to greet us. Their contented murmurings or loud grumblings seem to convey what kind of day they’re having. Often, they will wait patiently at our dining room doors for one of us to come out and join them or bring them a favorite treat. They seem to enjoy our company, as we enjoy theirs. I love their loyalty. Typically, they will scatter off into two or more groups, but if one hen strays a little too far, she gets called back by her sisters. They have their squabbles, but they also know how to stick together! Yes, you can learn a lot from a chicken, and we’ve certainly learned that they’re a wonderful part of our life bellissima. 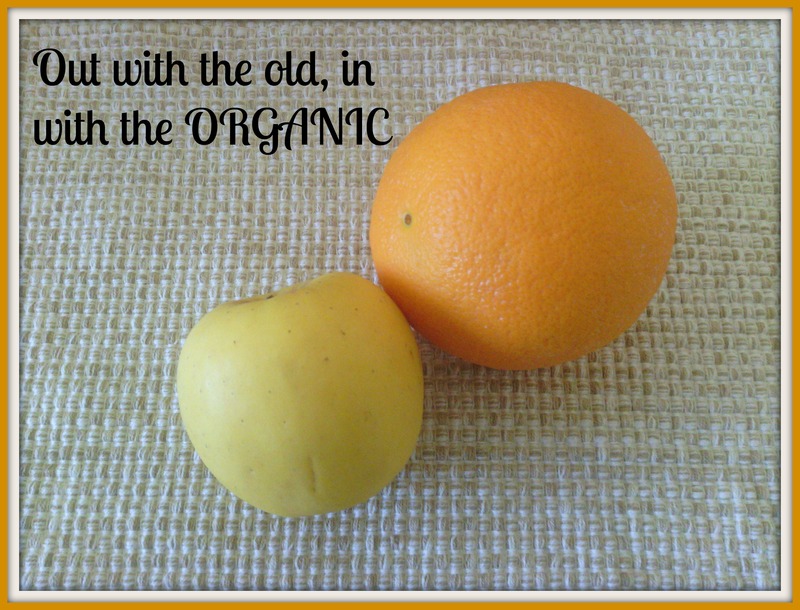 Out With the Old, In With the Organic! We’re settling nicely into our organic lifestyle. There is so much to learn, but I find it to be a very enjoyable experience! There were certain items I tossed out right away — products with artificial flavors, high sugar content or food coloring were out immediately. I truly felt liberated and loved that my family was on the road to a healthier lifestyle! We were cooking again and this time using quality ingredients! Organic food seems to naturally enhance the flavors of any dish. Now when I shop at a traditional grocery store, I notice I am buying much less. Why is that? Because I am passing by the many aisles filled with processed foods. I typically head to the produce department for organic fruits and vegetables, pick up a must-have in our home (Silk Dark Chocolate Almond Milk!) and am pretty much done with the exception of a few healthy treasures I find here and there. Our remaining food items are purchased primarily through Azure Standard in addition to monthly runs to Whole Foods. Buying organic ingredients in bulk has proven to be very beneficial to our household and makes healthier eating much more affordable! For example, I might spend close to $28. for 5 lbs. of organic cocoa powder, but that cocoa powder is going to last at least six or seven months! The main items we buy in bulk are flour(s), cereals, vanilla, oats, sugar and cocoa — the rest we typically buy in normal quantities. Cooking is back-to-basics, and it is great! I still use family favorite recipes that we have accumulated over the years as well as new-found favorites, but replace ingredients with organic ingredients or healthier alternatives. Some recipes are more challenging than others, but it’s fun working with them. Rule number one — be creative! If a recipe fails when using healthier ingredients, then try again. I’ve had some recipes fail miserably and some improve dramatically! 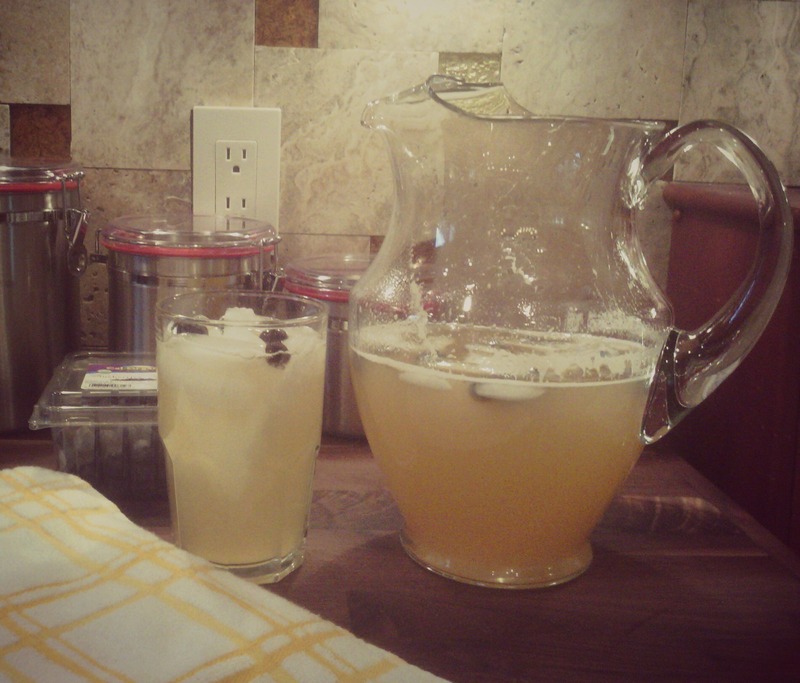 I love making lemonade in the summer, but even with organic lemons and sugar, I was still using a lot of sugar! So I tried honey. 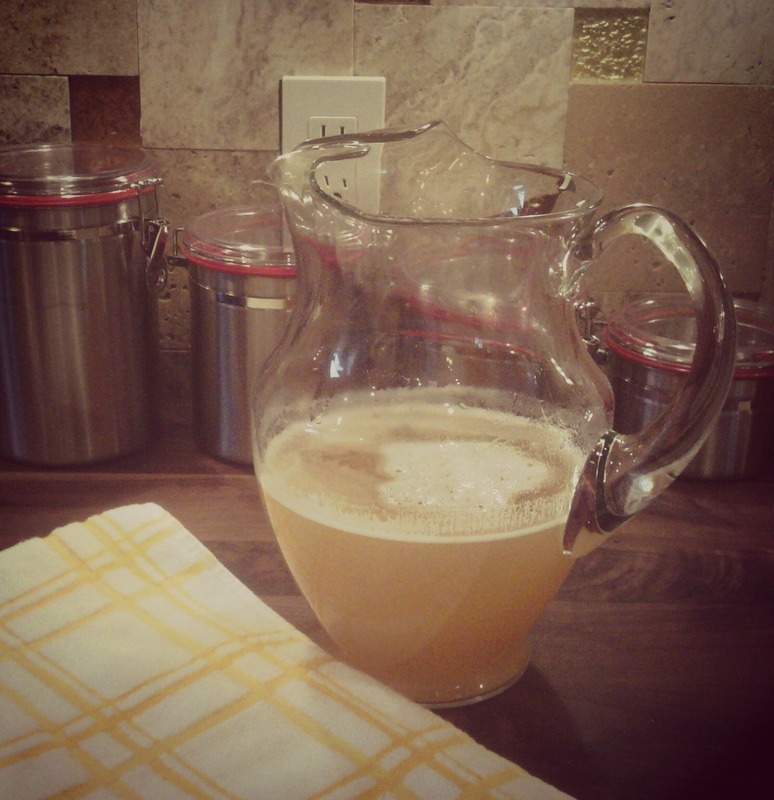 I began with half sugar, half honey, then gradually reduced the sugar to one-fourth of the amount and used honey for the rest. I loved it! Remember that with any recipe, not everyone is going to have the same taste, but typically there will be a way to make a recipe work for you in a healthier way. I’ve also learned that some recipes are best left alone, but can still be improved (health wise) by using organic ingredients. So don’t be discouraged, be encouraged and have fun! About three years ago, Jonathan and I became enlightened to the wonderful world of organics. Every once in a while, I would run across an organic item at our local grocery store and occasionally buy it, but I certainly didn’t have a vast knowledge on the subject. It’s interesting to know how I actually came across organic food/eating — of all things, couponing! After watching a couponing series on television many years ago, I hopped right onto the couponing bandwagon. I eagerly awaited double coupon days, had five Sunday papers delivered to ensure I had at least five of every coupon and signed up for online coupons. It was a challenge and became somewhat of a game to me. What can I buy on sale while using a double coupon? How many double coupons can I use in one transaction? I even bought a beautiful white binder and had my coupons (somewhat) organized. Please don’t take me wrong – I’m not trying to poke fun at those who use clip coupons. I think coupons are great, but my problem was what I was buying with them. One day while scanning my pantry, I pondered, “What are we eating?” I have always loved cooking, but it occurred to me I wasn’t really cooking anymore. I was turning on the oven and re-heating something — something altogether processed. Another thing became very evident — I didn’t feel healthy, and I knew if I wasn’t feeling healthy, my family wasn’t either. Around the same time, I began reading posts on my cousin’s Facebook page regarding organic/GMO-free foods. They were interesting — very interesting! Jonathan and I started watching every single food documentary we could find on Netflix, sometimes twice because we were fascinated. What were we eating? Even if I was the one doing the cooking, there were still plenty of processed ingredients accumulating in the dishes. We decided to visit Wholefoods (located approximately one hour away from us), and as we entered, I was the proverbial kid in the (organic) candy store! Organic produce in a rainbow of beautiful colors, 100% grass-fed beef, organic chocolate! I was a very happy girl! Within a few weeks of re-directing our diet, we were feeling so much better! The only problem I encountered was that I couldn’t make a quick trip to an organic grocery store. Don’t get me wrong, I am very thankful that our local grocery stores have increased the number of organic products they carry, (maybe from my numerous requests? ), but I needed additional shopping options, and I needed to be more organized. I prayed for direction because I wanted my family to be healthy! Then one glorious day, (after a few conversations on organic food) a dear friend of mine introduced me to Azure Standard. [ray of sunshine beaming into our home] She brought me a catalog and also mentioned I could look them up online. To say I was beyond excited is putting it mildly! My eyes grew wide with so many organic products to peruse — bulk flours, bulk cocoa powder, dark-roasted peanut butter (my personal favorite! ), fresh produce, pastas …. even organic chicken feed! 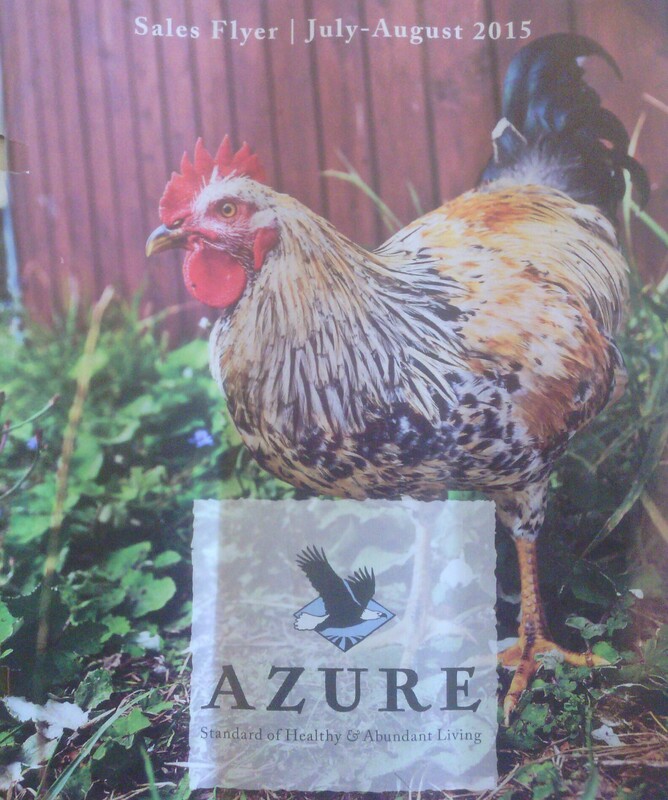 [ray of sunshine beaming over the chicken coop] We’ve been happy Azure Standard customers ever since, and I’m sure you understand that we recommend them highly! After signing up, orders can be shipped directly to your home or can be picked up once a month at a local drop point. They offer exceptional service and an extensive variety of products. Shopping in bulk has been incredibly helpful in meal planning as well as cost-effective. Believe me, we’re certainly not perfect and still learning. Although we would love to, we haven’t managed to eat 100% organic 100% of the time. We do have days where we end up ordering pizza, but we do strive to live healthier lives and can certainly tell the difference when we meander off the healthier path. I’m looking forward to serving up some beneficial blogs at the table (yes, puns intended! ), sharing some of the helpful information I continue to gather, delicious recipes, pantry organization (I’m working on this one — summer project #77) and favorite products I’ve found! So, how about you? 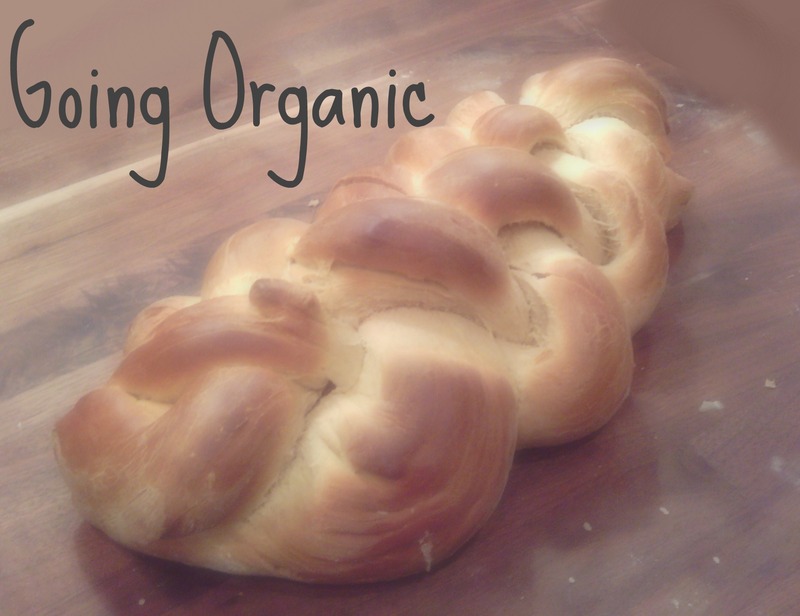 Do you have a favorite organic recipe or tip? I’d love to hear from you!